With our iPhone mobile application, you can easily browse through all of the pets, contact rescuers/owners, share on Facebook/Email, save as favourites, view latest news, post member comments, submit animal abuse report and more! Please proceed to the page below to read on its functions and download the app. Please don't forget to rate and review it at the iTunes App Store and share it with your friends so more animal lovers are aware of it! If you have any questions, feedback or bug reports, please submit it here. Thank you! Re: PetFinder.my iPhone App - Launched! Nice maybe , say , later we can have apps for Blackberry as well..
congrats to you too Andy and of course to your team members as well! Thanks guys, hope we can get more exposure for the animals through this extended mobile network! Khairul - Thanks bro, hope to see you again in our coming October event! 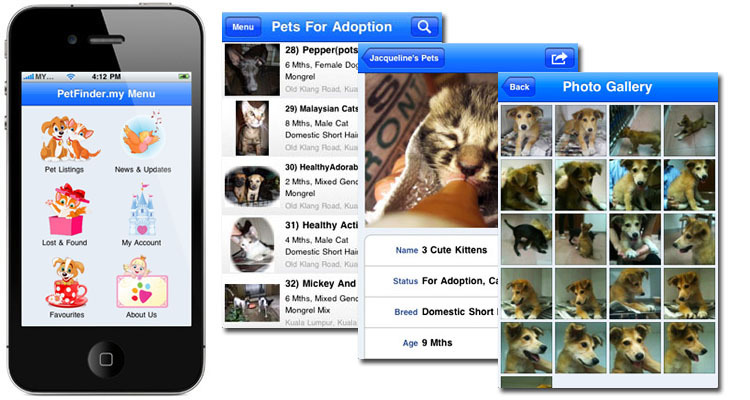 PetFinder.my's iPhone App has reached the TOP 20 of Apple iTunes' Top Social Networking Applications within 24 hours of launch! Better still, it is currently being featured at the TOP Spot of new & noteworthy applications! I tried it on my Blackberry and what's more can i say Andy...The mobile version is superb.. you really 'listen' to us... Thank you once again..and thumbs up..
What BlackBerry version are you using, can you please help me test out the functions and let me know if any problems? Especially the functions at the pet profile pages such as share on facebook, email, add to favourites & call/sms. It is quite difficult to make everything display and align properly on all phones.. so if you see some problematic display, please let me know ya so I can fix it up! If possible, attach some screenshots too so I can more clearly identify the problem. I am using BlackBerry Storm (1) 9530 ~ the one you use in the pic..
1. Pet enquiry is damn superb. I can directly email / message without exiting browser. 2. Align is also nicely fit when the phone is used vertically but when used horizontally, it does not follow the horizontal screen..Instead, it remain small as the one viewed vertically. 3. When I try to share it on email..It comes out a window with this "The protocol specified is not supported by the handheld. Please try a different URL"
So far everything is okay accept for the alignment I mentioned. But then Andy.. forum? no easy access button? Thanks for your info and compliments! Regarding the alignment when you rotate your phone horizontally, you will need to refresh the page to change the display mode. It appears that BlackBerry's browser does not auto-realign the content properly. For the Share on Email, this appears to be a BlackBerry bug. I've just applied a patch to it, can you reload some pet profile page and see if it works? I had to include an "@" symbol as a fake email address to trick BlackBerry into launching the email composer haha. Update your iPhone app now, or if you haven't installed it, get started now and transform yourself into an animal welfare evangelist with your iPhone! How much does it cost? 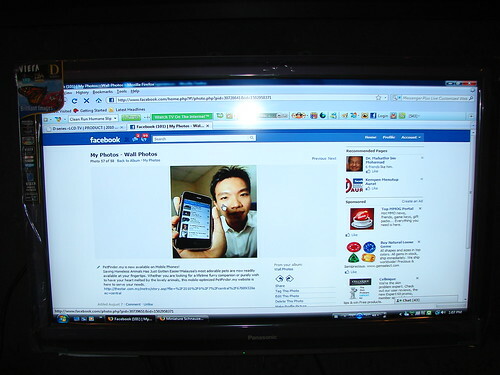 My Samsung 23" LCD 1 year+ ago was about RM600+..
p/s: Seems like you have a ton of unread messages and notifications on Facebook as I can see on the screenshot haha! Just Fixed on Wall, using HDMI cable link to notebook. Look cool with 42 LED screen from Panasonic D model RM4950. Wow! Andy you eyes too sharp able look on it unread massage. Last edited by dog is my buddy; 08-14-2010 at 02:46 PM. Andy, you really have sharp eyes to notice that Clement hasn't been reading his messages and notifications! My notifications need read until Hari Raya. Too many. By the way, myself too many fans! !